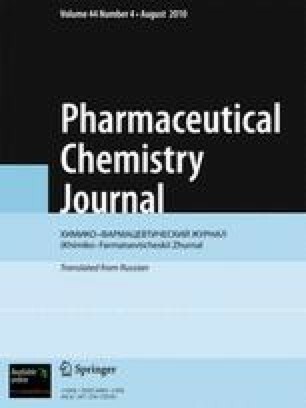 The new multifunctional antioxidant 3,5-dimethyl-4-hydroxybenzylthiododecane (DHBD) demonstrated high activity both in vitro and in vivo. Experiments in vitro showed that the antioxidant activity of DHBD significantly exceeded that of the well-known reference drug ionol. A course of DHBD administration (100 mg/kg, p.o.) significantly decreased the content of lipid peroxidation products in rat brain on the model of long-term incomplete cerebral ischemia. Translated from Khimiko-Farmatsevticheskii Zhurnal, Vol. 44, No. 4, pp. 25–27, April, 2010.